Jason Morrow can’t wait to see Mack on the day of his riding lesson. “Mack is a good horse, and he has good posture,” the 24-year-old says of the equine friend he works with at Therapeutic Riding of Tryon. Jason began instruction with TROT shortly after it was founded in 2004. It’s a program of Foothills Equestrian Nature Center and uses the healing, gentle nature of horses to help people with physical, developmental, and cognitive disabilities improve balance, strength, coordination, focus, and confidence. 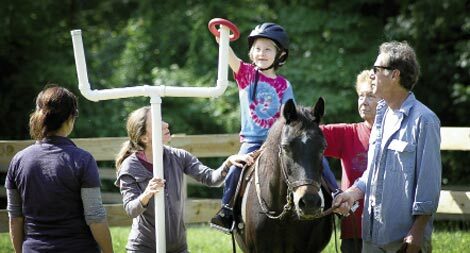 Accredited by the Professional Association of Therapeutic Horsemanship International, TROT serves students ages four and older. Each week, students typically attend a one-hour class tailored to their needs. The therapy begins with saddling and grooming the horse. Time in the saddle involves walking the paddock with the assistance of volunteers. More experienced riders can take a faster gait. Participants who aren’t able to ride benefit from the program by brushing and interacting with the creatures. Like almost everyone associated with TROT, Hambright is a volunteer, as are all the horses, including her eight-year-old Gypsy Vanner gelding, Jesse. The benefits are more than psychological, says Sibley, who is one of TROT’s two PATH International-certified equine instructors. People with mobility issues can get a sense of walking by being on the back of a striding horse. Touching, smelling, and listening to a horse can help people with autism, who often focus on one activity intensely, integrate multiple senses. Having a horse start and stop at their command gives riders instant feedback that they can process and understand. Jason’s mother, Kristy Morrow, enrolled him in the program to improve his muscle tone. She also hoped the lessons would help him learn to follow instructions and complete tasks in a sequential, logical manner without being reminded of each step. She’s noticed great progress. Jason sits tall in the saddle and is very social, thanks to the opportunity to help around the barn. Riding is something he does that his able-bodied siblings don’t, and that boosts his self-esteem. “When you’re there, you make new friends,” Jason says. The next 10-week session begins in September and is open to residents of Polk, Henderson, and Rutherford counties and Spartanburg and Greenville counties in South Carolina. There is a fee to participate, but scholarships are available. If you’re interested in training to become a volunteer, sharing your horse, or enrolling a student, call (828) 859-9012 or visit www.fence.org/trot.